We live in a highly connected world these days with nearly half (45%) or 3.3 billion people using the Internet by the end of 2016. A majority of these users, 2.6 billion, are accessing the Internet using a mobile phone reports eMarketer in their roundup of media usage measurements from around the world. 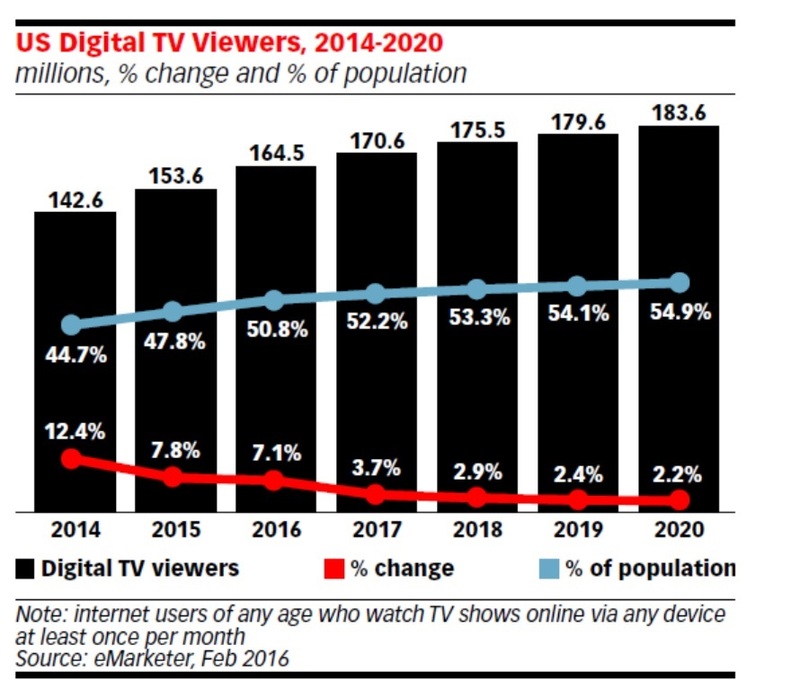 The increase in digital access provides a surge in television viewing. This year eMarketer estimates that 205.7 million U.S. adults will watch TV through traditional channels while 129.7 million adults will watch digital TV. Access to over-the-top TV and the abundance of new content from Netflix, Amazon and Hulu has also contributed to the growth of the digital marketplace. It’s predicted that by 2018, U.S. adult viewers of traditional TV will drop to 202.1 million while adults watching streaming TV will increase to 138.8 million. Industry experts expect traditional television viewing shifts in favor of digital streaming services given all the new content and the ability to view on multi-platforms. Viewership by demographics points to some big differences. The biggest consumers of total digital video consumption which includes TV shows, movies, news, and even advertising are the millennials. eMarketer estimates that 93.7% of millennial internet users will watch digital video content in 2016 and grow to 94.1% by 2019. In particular, nearly all (96.5%) of adults 18 – 24 internet users will watch streaming video this year. Consumers worldwide are accessing lots of different content on mobile from social networking sites to messaging apps to streaming music to digital TV. Mobile has been the first digital screen for many throughout the world especially in Africa, Asia and Latin America. Further, usage of mobile messaging apps grew to 1.4 billion consumers in 2015, an increase of 32% from the prior year. eMarketer predicts that by 2018, mobile chat users will reach 2 billion or 80% of smartphone users. WhatsApp and Facebook Messenger, both Facebook owned, are seen at the two most powerful apps globally. The growth of video streaming and mobile messaging continues to provide publishers and marketers with new opportunities to reach consumers. The variety of content from high quality to consumer generated and the ability to share instantaneously offers a social extension for marketers to use both domestically and abroad. The quality of the playback experience is a vital consideration for any streaming video provider: viewers abandon quickly, often remember having done so and avoid offending providers in the future, according to a survey conducted by Video analytics and optimization company, Conviva. They also found that different genres have different sensitivities. While entertainment viewers demand smooth playback but are forgiving on picture quality, news and information viewers demand both a great picture and uninterrupted streaming. Additionally, age demographics appear to be significant in establishing how deeply to focus on quality of experience. In the Fall of 2015, Conviva surveyed 500 Internet video users across the United States to understand their sensitivity to playback experience on streaming videos across the entertainment, news/information, education, self-improvement and product research genres. The paper reports the findings and provides commentary on what they mean for streaming video providers seeking to build, maintain and grow successful OTT businesses. When the latest Apple TV went on sale last week, it was well received by reviewers and almost as quickly decried for its potential to disrupt the television ecosystem. While OTT has certainly had an impact on the cable TV business, Apple’s latest foray has the potential to make apps the new must-see TV channel. 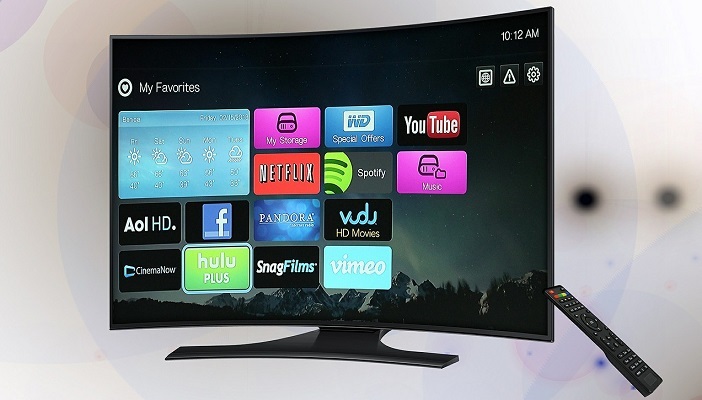 Yes, Edmunds TV will deliver their web experience to your television. But even more importantly, according to Stephen Gandee, VP of Product and Design at Edmunds.com, it offers the ability to deliver content that parallels the consumer’s cross-device path to purchase. Given how effective apps are as a component of the ecommerce journey, the app-ification of television could provide the optimal intersection of content and commerce. It’s no coincidence that Edumunds.com chose iOS for its OTT move. The company carefully monitors how its audience behaves across different platforms and when analyzing these behaviors, they noticed an interesting difference between Android and iOS car shoppers: While users of both mobile operating systems favor the Toyota brand, iOS users skew to premium brands overall—favoring BMW, Mercedes-Benz and Lexus. Needless to say, this affluent (or aspirational) iOS mobile user is likely to be a fan off Apple TV as well. At launch, Edmunds TV will leverage the video assets in which the company has already made a significant investment. The company currently boasts a six-person video team, producing reviews as well as information on specific issues to car buyers—such as whether to buy or lease—as well as helpful information like how to jump start a car. The pay-TV industry contracted in the third quarter at a faster pace than a year earlier, signaling that “cord cutting” may well be on the rise, as more consumers drop cable and satellite-TV connections. According to MoffettNathanson, LLC, the pay-TV industry lost about 179,000 TV customers, a steeper loss from the decline of 83,000 in the year-earlier quarter. Already, more homes and businesses have dropped pay-TV service in the first three quarters of this year than in the whole of last year, according to MoffettNathanson estimates. 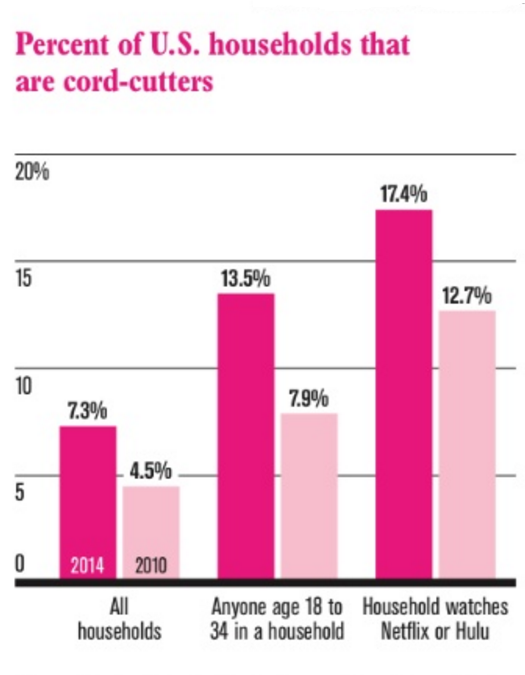 Experian Marketing Services estimates that there are 13.8 million adults—or 5.6 million households—that are prime to be among the next wave of cord-cutters, which means the cord-cutter population has the potential to almost double. Looking more closely at these individuals, many already have one foot out the door when it comes to losing their cable subscription as they are 74% more likely than average to say they watch less traditional TV. Experian predicts that cable will be even less popular among Millennials than it already is, as half of these potential cord-cutters hail from this generation. Parks Associates consumer research finds the majority (58%) of broadband households in the U.S. use at least one OTT video service on a monthly basis, while more than a quarter of households use two or more services. Blacks are at the leading edge of new viewing technologies, according to Horowitz Research FOCUS African America report, with 36% of Black viewers saying new technologies are enabling them to watch more TV than previously. The research also finds that Black viewers report spending 23% of their TV viewing time streaming content. In contrast, White viewers report spending 18% of their TV time streaming. 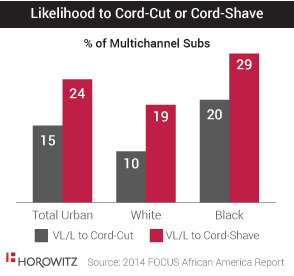 Black multichannel subscribers are twice as likely as Whites to report being likely to cancel their TV service in the next six months (20% vs. 10%). Findings suggest that a greater reliance on new video technologies, rather than a lack of interest in TV, may be a contributing factor. Horowitz Research’s FOCUS Latino report finds that Hispanics are very likely to have made streaming an integral part of their video viewing lifestyle. Half (51%) of Hispanic TV viewers in the study report spending 20% or more of their time watching over-the-top (OTT) content, compared to 43% of total urban TV content viewers. 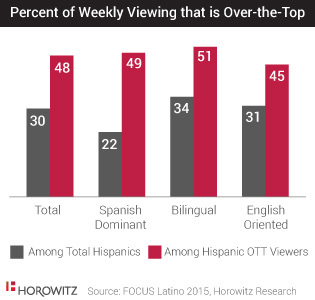 Among Hispanics, OTT viewing is being driven by bilingual and English-oriented Hispanics. More than half of bilingual (54%) and English-oriented (56%) Hispanics report spending more than 20% of their viewing time streaming, compared to 35% of Spanish-dominant Hispanics. Not surprising, video consumption preferences vary by generation. 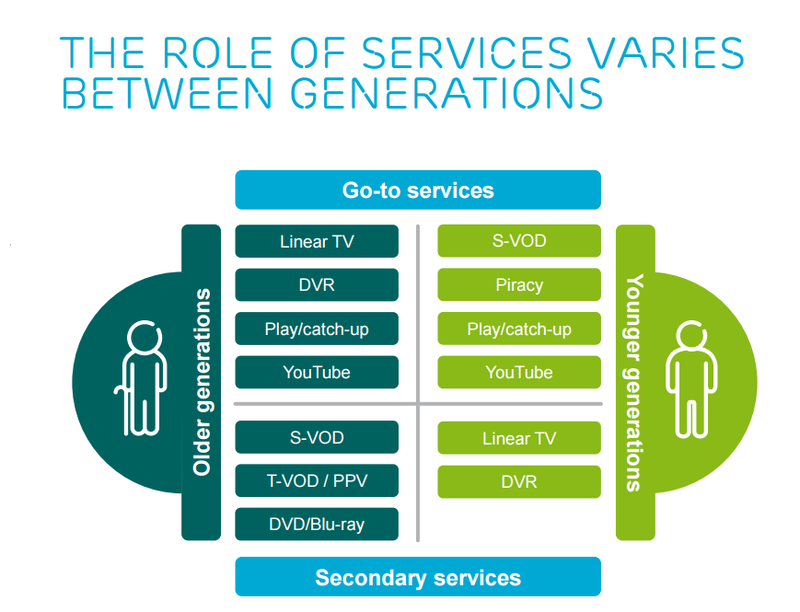 Younger generations “go to services” include streaming video on demand and YouTube, where older generations do rely on YouTube, but favor Linear TV or VOD. according to an Ericsson presentation. Not surprisingly, age is a factor: The more young-adults in the household, the higher percentage of cord cutting, according to Experian research. SMART TV penetration has reached a milestone in Q2 2015 with 46 million U.S. internet households now owning a connected device. According to NPD’s Retail Tracking Service these devices include TVs, video game consoles, streaming media players, and Blu-ray Disc players that consumers can connect to the Internet giving access to over-the-top (OTT) content services such as Netflix, Amazon Prime and Hulu for over-the-top content. As connected devices increase in penetration, pay-tv subscribers see declines. Approximately 470,000 video subscribers dropped their pay-tv service in 2Q 2015, up from 305,000 video subscribers lost in 2Q 2014. More connected televisions also impacts advertising placement. The Association of National Advertiser (ANA) reports that close to half of current connected TV and OTT advertisers (48%) plan to increase their OTT media budgets next year, with advertising dollars coming from traditional TV activity (71%) and digital media (37%). Doesn’t it seem like this year’s Upfront presentations were filled with way too many acronyms, making it harder and harder to make sense of them? Playing House’s Executive Producers, writers and stars Lennon Parham and Jessica St. Clair break down what they all mean and how they illustrate the innovation taking place at NBCUniversal. The State of Online Video is Limelight Networks’ latest in a series of annual surveys that explores consumer perceptions and behaviors around digital content. The State of Online Video 2015 report is based on responses that Limelight Networks received from 1,206 consumers ranging in demographics, gender, and education. According to the findings, most people watch 1-2 hours of online video each week, though younger viewers do watch more overall. When asked under what circumstances respondents would terminate service with their cable or pay-television subscriber, the largest percentage of respondents indicated, by a wide margin, that they would terminate their subscription because of increasing prices. Again, this number is even higher among young Millennials of which more than 40% indicated that they would terminate for financial reasons. New data from Juniper Research shows that subscriptions from over-the-top (OTT) TV providers such as Netflix and Amazon Prime will generate $31.6 billion by 2019, up from just under $8 billion in 2014. 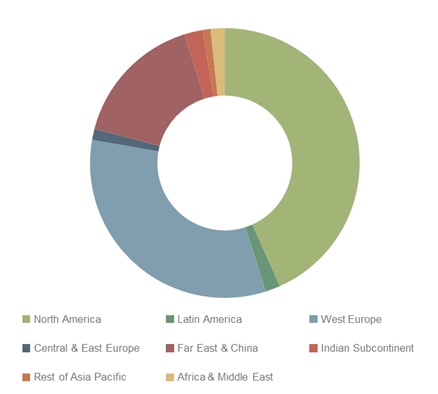 According to Juniper’s report Mobile & Online TV & Video: OTT, IPTV & Connected Markets 2015-2019, continued growth in the established markets of West Europe and North America, along with the emergence of key OTT players in the Far East and Asia Pacific, will bring a surge in the uptake of OTT subscriptions over the next four years. This behavior originated from the trend for DTV given that online video does not conform to a schedule and Internet TV and online video services often see less advertising within the show compared to shows on traditional TV. Consumers are also easily able to share online videos via social networking sites or email, which has been a key driver in the proliferation of such a service. Global subscription revenues from OTT services will approach $32 billion in 2019, compared to just under $8 billion estimated in 2014. Continued growth in the established markets of West Europe and North America, along with the introduction of key OTT players in Far East & China and Rest of Asia Pacific, will bring a surge in uptake of OTT subscriptions over the next 4 years. As of March 2015, some content is available in the online space, most notably from Amazon Instant Video, who have around 30 movies available in 4K, as well as several of their original TV series. Netflix also provide some of their original shows such as House of Cards and Marco Polo in 4K. Netflix had been providing 4K content to all subscribers since April 2014, but in October of the same year it announced that it would charge those subscribers who wanted to enjoy their 4K service a higher fee. It is now the company’s most expensive service tier at $11.99 per month and requires users to sign up for a ‘family’ plan that allows the simultaneous stream of up to 4 programs. One of the biggest threats to the traditional TV industry, is ‘cord-cutting’- consumers cancelling their satellite or cable TV services in favour of cheaper deals from streaming companies such as Netflix and Hulu. Many broadband service providers now offer quad-play packages, which add mobile to the current triple-play system, making for an even more appealing package. In February 2015, the UK triple-play provider BT purchased mobile network EE for £12.5 billion ($20.2 billion) with deal expected to be finalised in March 2016. With the addition of EE, BT will now be able to offer quad-play packages. However, the emergence of services such as Sling TV, offering a cheaper OTT alternative to cable and satellite subscriptions while providing a range of quality entertainment channels, may serve to disrupt this model. In addition to the full research, Juniper has also published the whitepaper, OTT ~ A Threat Networks Can’t Shake Off. Access and entertainment research from Parks Associates finds 57% of consumers in U.S. broadband households subscribe to an OTT (over-the-top) video service, such as Netflix or Hulu Plus. In its new report, TV Everywhere and the New World of OTT, the research firm reports the average U.S. broadband household spends $9 per month on Internet video, up from $7 in 2012. There will be nearly 50 million streaming media players sold globally by 2017. S. broadband households watch an average of 3.4 hours of Internet video per week. 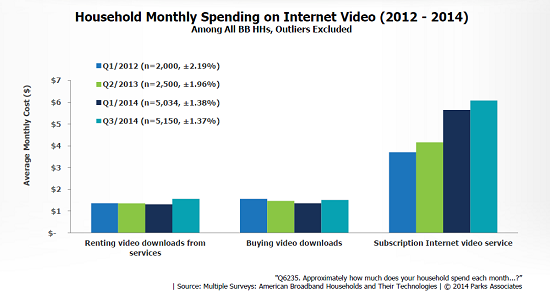 S. broadband households spend more than $6 per month on average on subscription OTT video services. Among U.S. broadband households with a pay-TV subscription, 15% are very interested in at least one OTT service, compared to 9% of households without a pay-TV subscription. 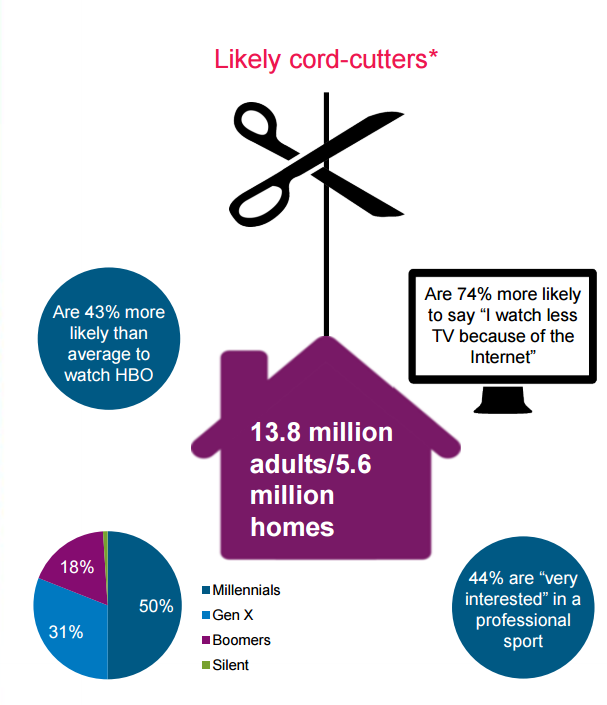 7% of U.S. broadband households are likely to subscribe to an OTT video service from HBO. 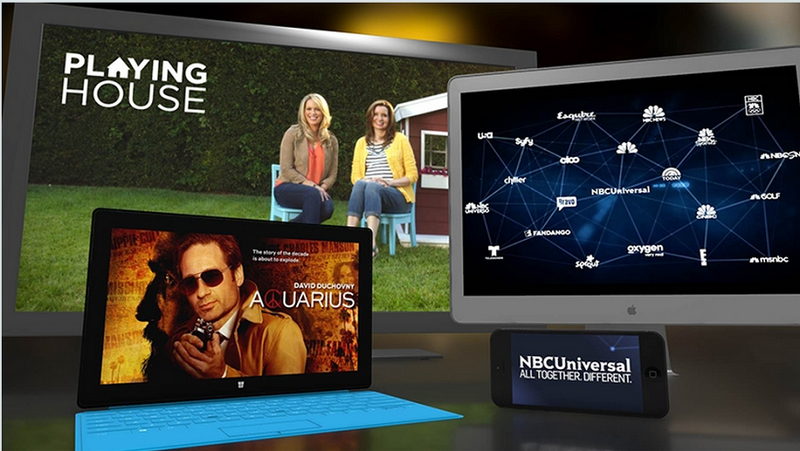 Over 50% of U.S. broadband households subscribe to an OTT video service. More than 75% of streaming media player owners have an OTT subscription. Homes with children spend on average 90% more on OTT services and digital video than homes with no children.